We create fine kitchen cutlery with a focus on customization, quality and beauty. Every knife is one of a kind, never to be reproduced again. 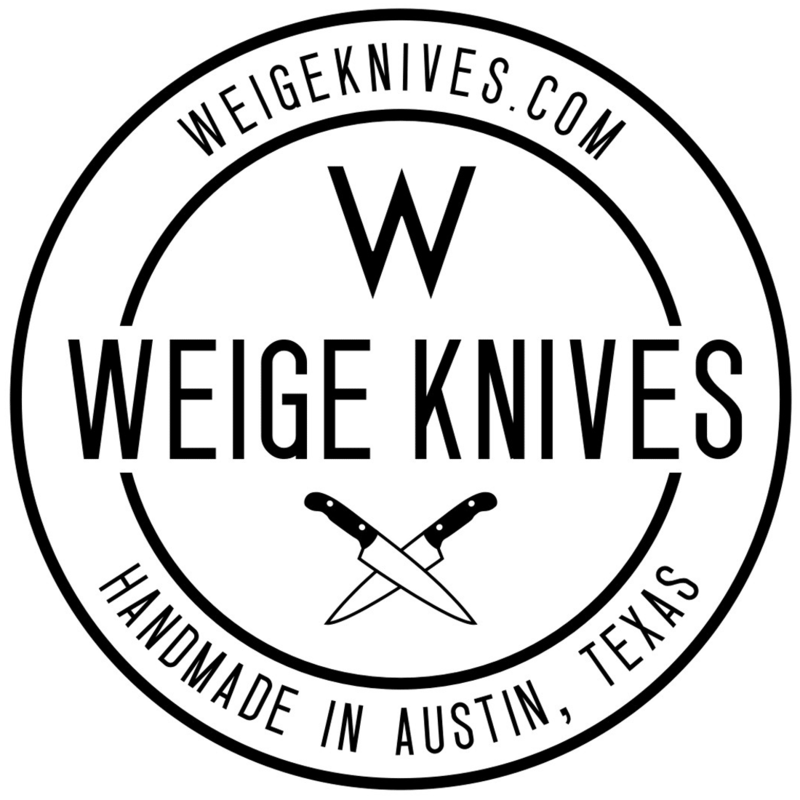 All knives are handmade in our small shop in beautiful Austin, Texas. Choose the type of steel, handle material, liner color, pins and have a clay mold of your hand made so the knife fits perfectly each time you pick it up. We sharpen knives, put new handles on old knives, refurbish and repair usable knives, family heirlooms. Send them in via mail or stop by our shop. Both of our knives from Travis prove their worth not only in aesthetic beauty, but where it arguably counts most—in function. I have been in the professional food business for more than 35 years and this is the best knife I’ve ever owned. Of course, it was MADE for me! Perfectly balanced, everything I wanted AND beautiful. Weige Knives are awesome. Travis is an artist and a relentless perfectionist who has followed up with me multiple time since delivering these beautiful tools to ensure my complete satisfaction. I could not be happier with my Weige Knives. The knife he made for my wife is light, perfectly balanced, and razor sharp. It’s a pleasure to hold in the hand and even more fun to use. I’m already back on the list for another. This is the single best knife I have ever used in my life. I am extremely honored to be the owner of this amazing knife. It is absolutely gorgeous and is performs fantastic. Great quality, great personal service and a fair price. I could not have asked for more. Even now I am thinking of my second order. My knife has been fantastic. It’s so nice that I tend to be select about when I use it. It certainly stands out among other knives and draws the attention of fellow cooks. My knife is not only one of a kind, it is absolutely THE best tool I have ever used in my 35+ years as a working chef. Knife is well balanced, comfortable, and sharpens easily. Only knife I use now.